In this solo cooking adventure, Kate makes her first foray into pie making. Okay, maybe not this pie specifically, but I made a version of this pie using the very same recipe sent by the very baker no less. Let’s just say that this pie was the inspiration for a slightly less gorgeous, but almost as tasty concoction, made by yours truly. I had never made a pie before. When I experienced Nancy’s Rhubarb Pie for the first time, BF and I were in the Midwest visiting his family. We sauntered into the kitchen one evening beers in hand, after a long day of hiking and sightseeing, ready for a chat and to lend a hand with dinner. And then I saw it. “What is that?” I wondered out loud about the golden thing of beauty sitting on the counter, even though I guess I knew exactly what it was. I had just never really seen such a thing of perfection. It looked almost ethereal, sitting there cooling on the kitchen counter, like it had been beamed down from heaven. From the look of it, once might expect choirs of angels to sing in harmony after each bite. 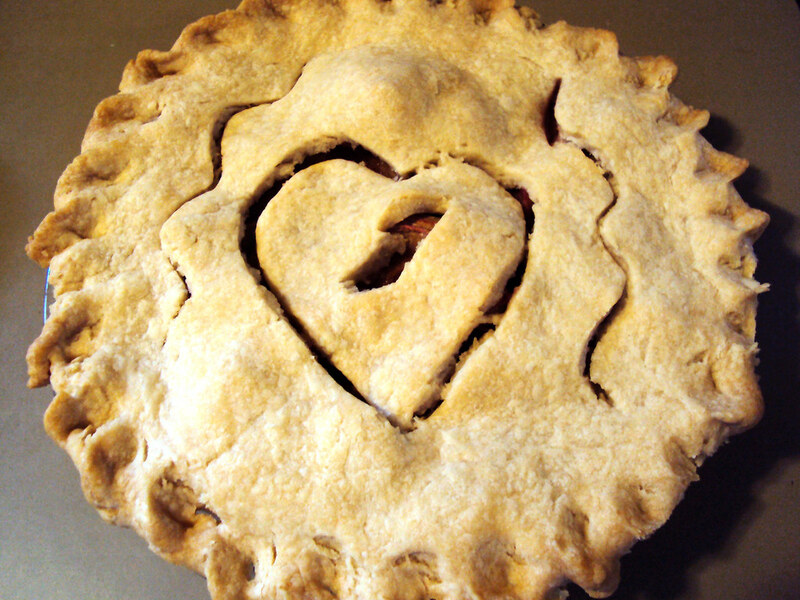 “Oh that?” began BF’s mom nonchalantly, “is a rhubarb pie. I had some rhubarb in my garden so I decided to make one.” She said this like it was no big deal. I disagreed. A local, seasonal yet traditional Midwestern dessert on a Monday night? My heart beat a little faster. I’ll swear up and down that I’m not a fruit dessert person, but when fresh fruit is pared with something homemade and buttery, and then topped with ice cream, you’ll be hard pressed to pry the plate away from me. This was no different. We ate dinner and I eyed dessert the whole time. How long would we have to wait for the pie? It was torturing me. Luckily it was served promptly after. A smidge of Häagen-Dazs vanilla adorned the top of each slice. I bit in. The pearly pink and sea green of the rhubarb was sweetened lightly with the sugar, but still was not too sweet. The crust was an almost savory biscuity-cookie that melted in your mouth. Flaky and rich, it served as a thick contrast to the creamy cold sweetness of the ice cream, and slightly tart tang of the fruit. Each bite had me closing my eyes for a bit longer than was appropriate at a family dinner. How does one decide to make a pie without first reading up on pie crust making techniques on the internet (like I did), and having first been inspired (as I was), and having a large chunk of Saturday afternoon (as I did) to devote to this momentous project? If you’re BF’s mom, apparently you just get inspired and make the pie. It took me on the other hand, a false start, a call to my mom (who knew you don’t want to overmix the crust once you’ve added the water? Apparently it results in overworked crust– something I learned after the fact), the promise of a special guest (pies are special! ), and a tense Saturday afternoon, but the pie finally got made. No, it wasn’t as flawless-looking as Nancy’s. Or honestly, even quite as tasty. But it was still pretty damn good. And I got a huge kick out of decorating the top with a J for my guest of honor. And said guest, Jill, who also claims not to like fruit desserts, cleaned her plate. She didn’t go back for seconds. But I did. Sift flour and salt into medium sized bowl. Cut in shortening with pastry blender (or two forks) until mixture is crumbly. Sprinkle water over– 1 tablespoon at a time and mix lightly with fork just until pastry holds together and does not cling to sides of bowl. Do not over mix. Shape half the dough into a ball and roll out on a lightly floured pastry cloth with rolling pin to a circle roughly 3 inches larger than the top of the pie plate. Gently ‘re-roll’ the dough onto the rolling pin, and roll off onto the empty pie plate. Gently press, with fingers, the dough into the pie plate so that it fits firmly. Use scissors or knife to trim the dough to within half an inch of the plate. Prick the bottom and sides of dough with fork to prevent air bubbles from forming. After pie filling is added, repeat procedure for rolling out crust, adjust over filling, trim to match bottom crust, and crimp edges together. Cut slits in top crust to allow steam to escape. 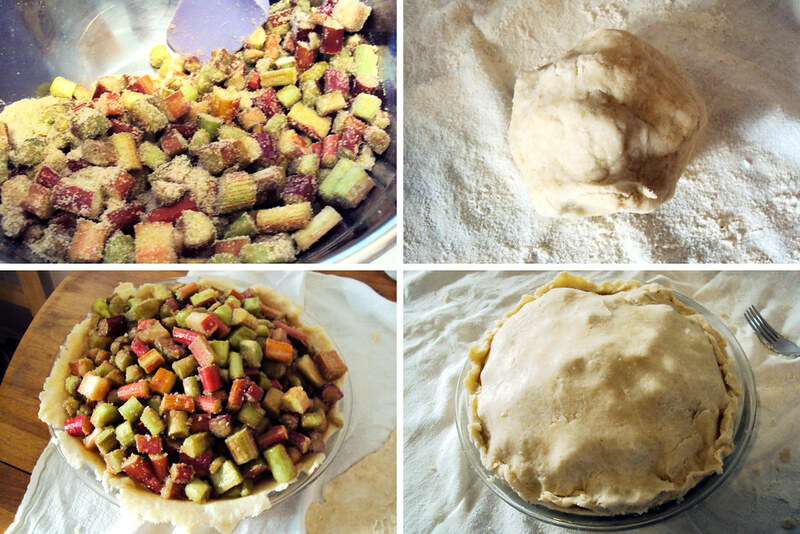 In large bowl, combine rhubarb, sugar, flour, and cinnamon. Stir gently until well coated. Transfer to pie plate. Cover with top crust (see above). Bake at 375 for 45 minutes or until top crust is brown around edges. 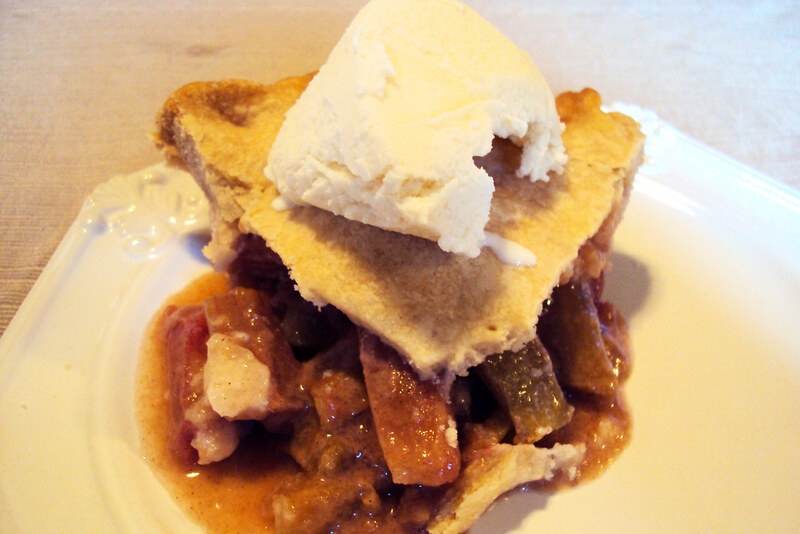 Note: You CAN make this pie with frozen rhubarb, but I always have better luck with fresh. If you DO use frozen, let it thaw for 45 min, drain off liquid, and use partially thawed. Otherwise, it gets very ‘runny’.